We offer a complete range of reliable kits specially designed to grow kitchen herbs, spices, fruits and vegetables or beautiful flowers at home - It is what we call URBAN FARMING. Kits are supplied with soil, seeds and containers and you just need to add water to start enjoying. Our flowers, vegetable and kitchen herbs kits are just great to grow food at home and our gift range educates kids to a greener place. We offer fantastic value with distinctive & beautiful packaging, re-usable containers, easy to follow instructions and great accessories. Our seeds are selected by industry experts. All our seeds are natural and are tested for purity and germination. Our unique seeds' rigid packaging requirements ensure best-in-class freshness. Ask for our extensive seeds selection. 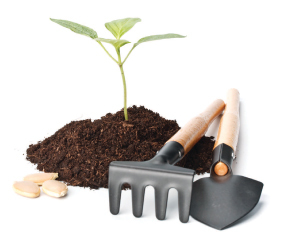 Our exclusive soil preparation is designed by experts. Sustainably produced, it is free of bacteria and contains micro nutrients including potassium to offer great potting soil. Our exclusive range of accessories keeps varieties clearly labeled and organized. Our social code places expectations on suppliers to provide a safe workplace for employees, respect human rights, and apply proper ethical standards in all business dealings. We inspect all ﬁrst level suppliers to ensure the requirements are met on a practical level. Our quality exceeds standards and legal requirements. We are reach ready and do not use any harmful materials or ingredients such as lead or phthalate. Our instructions are clear and easy to follow. Our additional user-friendly growing tips attempt to ensure customer satisfaction.